Turkish family which, from the seventeenth century onward, produced several rabbinical writers. It had several branches, of which one was at Jerusalem and another at Constantinople. Rabbinical writer; was living in Jerusalem at the beginning of the nineteenth century. He was the author of "Pi-Shenayim" (Salonica, 1806), novellæ to Jacob ben Asher's Ṭurim, and "Bene Binyamin" (Jerusalem, 1807), responsa, published by his stepson Jacob Saul Elyashar with the latter's "Ḳereb Ish." Rabbinical author; born at Constantinople; died there 1735. At the age of ten he was sent by his parents to studyin Jerusalem. Later, when delegated to Constantinople as solicitor of alms for the poor of Jerusalem, he was honored with the title "Rab." He married the daughter of the wealthy Judah Ergas of Constantinople. Nabon was the author of "Maḥaneh Efrayim" (Constantinople, 1738), a collection of responsa. Rabbinical writer; lived in Jerusalem in the seventeenth and eighteenth centuries. He is the earliest known member of this family. He wrote a volume of sermons which the bibliographer Azulai saw in manuscript. Turkish rabbinical writer; born in Constantinople 1733; died at Jerusalem 1787; son of Judah Nabon. He left a work entitled "Din 'Emet," which was published (Salonica, 1803) posthumously; it contains novellæ on Jacob ben Asher's Ṭurim and on Joseph Caro's commentary on that work. 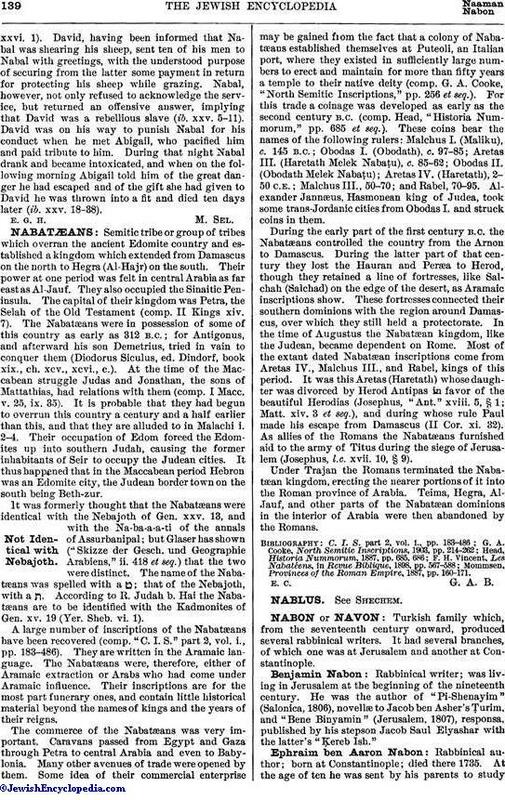 Rabbinical writer; born at Jerusalem 1713; died there 1760; son of Hanun Nabon. He was celebrated for his Talmudic and cabalistic learning, and was the teacher of Ḥayyim Joseph David Azulai. Nabon wrote several works, of which only two have been published, namely: "Neḥpah ba-Kesef" (vol. i., Constantinople, 1748; vol. ii., Jerusalem, 1843), responsa; and "Geṭ Meḳushshar," on divorce, in the form of a commentary on "Geṭ Pashuṭ," a work on the same subject by Moses ibn Ḥabib. Chief rabbi of Jerusalem, succeeding Sozin in 1836; died 1840. He was a grandson of Jonah Nabon. He wrote a short work, published together with his grandfather's "Neḥpah ba-Kesef." He was the first chief rabbi of Jerusalem to be given the title "Rishon le-Ẓiyyon." Hazan, Ha-Ma'alot li-Shelomoh, p. 47. 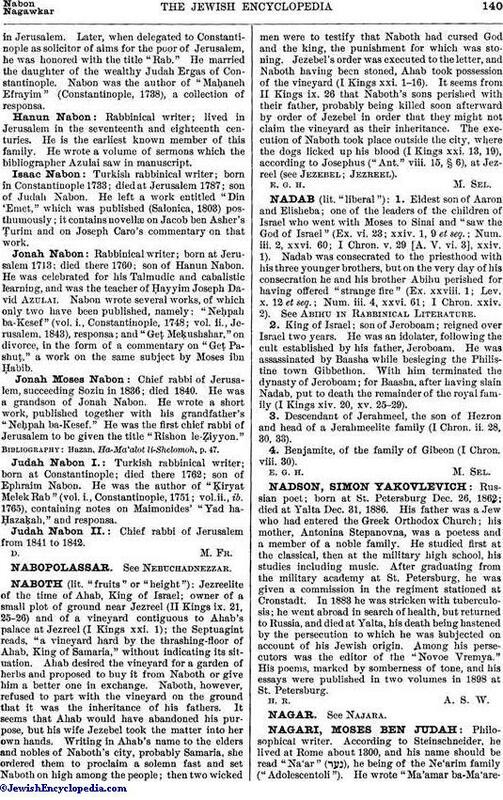 Turkish rabbinical writer; born at Constantinople; died there 1762; son of Ephraim Nabon. He was the author of "Ḳiryat Melek Rab" (vol. i., Constantinople, 1751; vol. ii., ib. 1765), containing notes on Maimonides' "Yad ha-Ḥazaḳah," and responsa. Chief rabbi of Jerusalem from 1841 to 1842.